Everyone loves a good mascot fight. I mean a cute furry Bear punching a cute furry Bird. Nothing beats that! There have been several great mascot fights my favorite of all time has to be the Stanford Tree vs the Cal Bear fight. Sadly, this video cuts off. 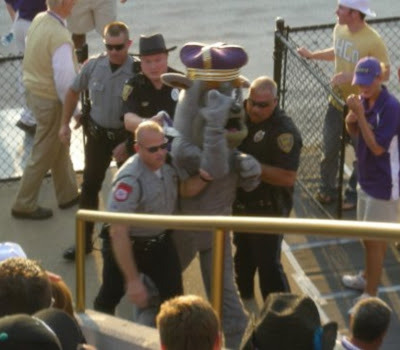 But what happens next, according to Harrisonburg's Daily News Record and several commenters, is that the Duke Dog continued pursuit of the other mascot and in the end was tackled and carried off the field by police. Just like the Taser guy, he was resisting the officers and even allegedly flicked off the crowd. As the Duke Dog resisted, police dragged him off the field and into a stadium tunnel. "They ripped off his head," JMU junior Brad Tephabock said. "They slammed him against the wall." Don't forget about the main page for more great stuff! This wasn't even the biggest mascot story of the day yesterday. The KC Chiefs mascot helped chase down and tackle the crazy fan who went on the field.